Home / 2016 Articles / How Deep Are The Nationals? But this offseason has been slower than usual, perhaps due to the uninspiring crop of free agents, and plenty of talented players are still looking for a home. We know the Nationals are still pursuing a closer, with Greg Holland a prime candidate. But general manager Mike Rizzo also has an opportunity to supercharge his bench, which is especially important given the lengthy injury history of a huge number of Nats. 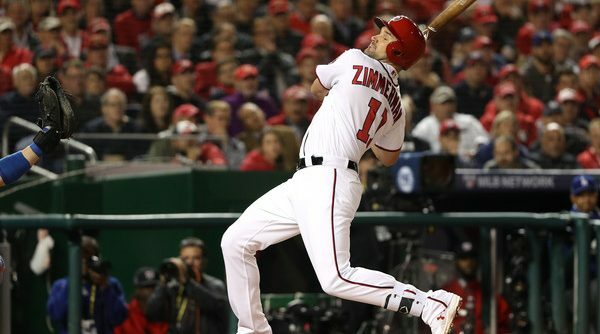 With money to burn, Rizzo should not be satisfied with the likes of Wilmer Difo and Clint Robinson potentially seeing significant playing time if injury-prone players like Anthony Rendon and Ryan Zimmerman miss time again. This piece is a position-by-position breakdown of the Nationals’ bench and minor league depth. Each section will answer two main questions: Are you comfortable with the primary bench guy starting for an extended period of time, and are you comfortable with the minor league guys in the majors? If that answer is no (and spoiler, it usually is), I look at some potential signings that could help the Nats weather injuries much better. Based on his production the past two seasons, you might groan seeing Taylor first in line to take over in center, but he’s actually a pretty solid backup. He can’t hit a lick, but stellar glove and arm make him a roughly one-win player if starting and a valuable late-game defensive substitute or pinch runner. Since older center fielders tend to move to corner spots, there aren’t many veterans bouncing around to be backup CFs. The Nats also have good minor league depth. Goodwin won’t top any prospect lists, but he hit very well in Syracuse last year and impressed Dusty Baker during his major league time. It seems like he’s been around forever, but he’s only four months older than Taylor. Bautista is also not a premium prospect, but he’s a blazing runner and great defender. On the other hand, he’s a mediocre hitter with zero power. Stevenson is both a great defender and a good hitter, though he’ll start the year in Double A. Hernandez is a newly signed Cuban who the Nats have said may start in extended spring training after not playing competitively since 2015, but at 29, he wouldn’t have been signed if the Nats didn’t think he could contribute in the majors in the near future. With great depth at the position, the Nats likely won’t add anyone to play center. Feel free to groan now, Taylor haters. His skillset serves him well in center, but if he plays a corner spot, his glove adds less and his bat looks even worse. Heisey hit well last year, but he is probably best suited to pinch hitting. Robinson hit like Taylor last year and plays abominable outfield defense, so we’d like to improve on him in an ideal world. As for the minors, the Nationals have no MLB-ready outfielders that aren’t centerfielders. As the best hitter and worst fielder of the four listed, Goodwin would be the best fit for a corner, though he would not be an ideal choice. Werth’s lengthy injury history makes having a viable corner outfield starter on the bench a priority for Rizzo — not to mention the fact that Harper isn’t exactly a picture of health either. Fortunately for the Nationals, the market is absolutely stuffed with corner outfielders. If you want a lefty to replace Robinson, your best option is probably Brandon Moss. 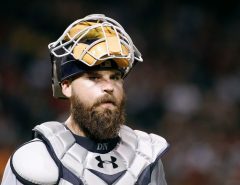 But not far off are the second tier options: Adam Lind, Pedro Alvarez, Logan Morrison, and perhaps Luis Valbuena if he’s willing to play left field. 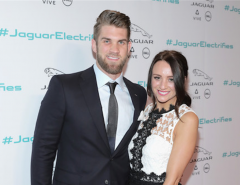 These players are also all capable first basemen, making any an excellent choice. If any are concerned about playing time, the Nationals can offer more than you would think: taking 40 games from Werth and Zimmerman creates half a season’s worth of starts already, with more to come if those two or Harper miss time with injuries. Given the acute need for a strong backup, the very full market of those players, and the low quality of the existing options, it would be very disappointing if Rizzo did not add one of the players listed above (or a similar one like Seth Smith or Jay Bruce via trade). But with the Syracuse outfield likely full, the Nats don’t have much to entice a corner OF veteran looking for a minor league deal. Minors: Emmanuel Burriss, Matt Skole if you squint real hard, Drew Ward, uhhh Stephen Perez? Woof. If you thought there was a need for a backup corner outfielder, get ready for this. Rendon is very injury prone. Murphy suffered a glute injury at the end of last season that the team said could recur. Turner is fine, and everyone is crossing their fingers as much as possible for him. Difo is among the team’s top prospects, but he didn’t hit particularly well at Double A last year. Burriss is a non-roster invitee to major league camp who had a 68 wRC+ at Triple A last year, and he really might be the best minor league option. Skole hit well at Triple A last year, but he’ll turn 28 in July, has never played in the majors, and is a lot more of a first baseman than a third baseman. Ward is a decent prospect who can only play third and first and has just one (bad) half-season at Double A under his belt, so he likely won’t be in the MLB picture for 2017. Perez is a utilityman who was an average hitter at Double A last year, and we are for sure scraping the bottom of the barrel here. Suffice it to say, the Nats really need a backup here. The man who filled that role last season would do so perfectly again: Stephen Drew. He’s a good lefty bat who can play all three of those positions, but he may have hit his way into a larger role after last year. After Drew, the free agent bench shortstops are Erick Aybar (-1.2 WAR last year) and Daniel Descalso (bad hitter and author of the worst moment in Nats history). The options widen up a bit if you’re comfortable with Difo getting time at short: You can sign a 2B/3B guy to be a backup bench hitter and leave Difo in the minors to be called up only if Turner is injured. Kelly Johnson and Aaron Hill are two good choices for that role, with Johnson perhaps holding the edge as a lefty. As with the corner outfield spot, it would represent a serious failure if the Nationals did not acquire a bench middle infielder. The team would also do well to add some veterans on minor league deals. This section is basically covered in the corner outfield and middle infield sections. Skole is a little more appealing as a first baseman and Soto is an MLB option as well. But Zimmerman is a near lock to miss at least 40 games, so his backup should be the strongest of any position’s. With the bat that he showed in 2016, Robinson simply won’t cut it. The Nats are actually pretty set at catcher! Severino is a good prospect who is capable in the majors, and Kieboom will make his AAA debut before becoming the next Lobaton when the latter’s contract expires after 2017. The Nats could add Matt Wieters and trade Norris if his price drops enough, though that seems unlikely. Like I said before, the major league team still needs a closer, and I fully expect they’ll add one to take over the spot Gott holds on this list. As it stands now, the Nats could have a competition for the long man and fill that role capably, with AJ Cole and Austin Voth as the clubhouse leaders. But they would be smart to sign one long reliever: Travis Wood. The ex-Cub has proven himself as an effective long man and absolutely suffocates lefties, which would allow him to serve as insurance for the risky pair of lefties the Nats currently have: Solis (injury risk) and Perez (bad). If Gott is pushed to the minors, the Nats will have good righty depth with him, Adams, and Martin, plus Cordero as a lottery ticket if he returns to health. Grace is the only notable lefty, which is not reassuring. The Nats added two intriguing lefties as non-roster invitees — Tim Collins and Neal Cotts — but both oddly have reverse splits for their careers, making them a poor fit for a traditional depth left-hander role. There are a lot of different names that could end up here, and a trade is a very realistic option, which makes speculating on names all but impossible.The free agent market has many good mid-tier options left, but I assume the Nats are only chasing a closer and players on minor league deals. But there are a few borderline names the Nats could consider: Seth Maness and Luke Hochevar as righties returning from injury, or JP Howell, an older lefty who should still have some ability left. The Nats’ starting pitching depth is acceptable. The MLB rotation is full but has injury risks, but I consider Cole and Voth to be good sixth- and seventh-starter options. Even if one is the long reliever, he could still make a few starts in case of injury like Yusmeiro Petit did intermittently last season. 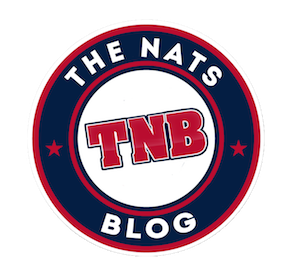 While the Triple A rotation seems full now, with Fedde not far away in Double A, the Nats could add another starter on a minor-league deal if Voth or Cole breaks camp with the big-league team. In that case, my vote would be for CJ Wilson, an injury-plagued lefty who just turned 36 and missed all of 2016 but had his best years in Texas with Mike Maddux. The trade of Lucas Giolito and Reynaldo Lopez means the Nats don’t have any high-end minor league starter options, and they won’t be finding any of those at this stage in the offseason. But even if they don’t add a starter, Cole and Voth should be a passable reinforcement pair.